Vice President Biden crosses paths with Romney and Ryan in Ohio. CLEVELAND — Campaign 2012 packed frantic suspense to the finish Tuesday, with Vice President Joe Biden landing unannounced next to Republican Mitt Romney in battleground Ohio even as voters across the country were deciding who would win the White House. President Barack Obama stayed in hometown Chicago, reaching out to swing-state voters on the phones and via satellite while the other three men on the rival tickets had a high noon showdown along the shore of Lake Erie. Romney and running mate Paul Ryan had scheduled the stop together just Monday, and Biden flew in to play defense as Romney waited on his plane for Ryan’s arrival. The vice president rolled off the tarmac without comment to the surprised media traveling with him, just as Ryan’s charter pulled in for a landing. The rush for Ohio and its 18 electoral votes highlighted the importance of the state to both campaigns’ victory plans. Polls going into Election Day showed Obama with a narrow lead there, and Romney said the eleventh-hour campaigning was meant to leave him with no regrets. Meanwhile, Americans headed into polling places in sleepy hollows, bustling cities and superstorm-ravaged beach towns deeply divided. All sides are awaiting, in particular, a verdict from the nine battleground states whose votes will determine which man can piece together the 270 electoral votes needed for victory. Obama has more options for getting there. So Romney decided to make the late dash to Cleveland and Pittsburgh on Tuesday while running mate Ryan planned another stop in Richmond, Va.
Obama visited a campaign office close to his home in Chicago and was met by applause and tears from volunteers before he picked up a phone to call voters in neighboring Wisconsin. He told reporters that the election comes down to which side can get the most supporters to turn out. “I also want to say to Gov. Romney, ‘Congratulations on a spirited campaign.’ I know his supporters are just as engaged, just as enthusiastic and working just as hard today,” the president said. Romney was asked on WTAM radio in Cleveland whether he agreed that voters always get it right in the end. “I won’t guarantee that they’ll get it right, but I think they will,” Romney replied. It wasn’t just the presidency at stake Tuesday: Every House seat, a third of the Senate and 11 governorships were on the line, along with state ballot proposals on topics ranging from gay marriage and casino gambling to repealing the death penalty and legalizing marijuana. Democrats were defending their majority in the Senate, and Republicans doing likewise in the House, raising the prospect of continued partisan wrangling in the years ahead no matter who might be president. The forecast for Election Day promised dry weather for much of the country, with rain expected in two battlegrounds, Florida and Wisconsin. But the closing days of the campaign played out against ongoing recovery efforts after superstorm Sandy. Election officials in New York and New Jersey scrambled to marshal generators, move voting locations, shuttle storm victims to polling places and take other steps to ensure everyone who wanted to vote could do so. In New York City, authorities planned to run shuttle buses every 15 minutes Tuesday in storm-slammed areas to bring voters to the polls. In Ocean County along the New Jersey coast, officials hired a converted camper to bring mail-in ballots to shelters in Toms River, Pemberton and Burlington Township. “This is the happiest vote I ever cast in my life,” said Annette DeBona as she voted for Romney in Point Pleasant Beach, N.J. The 73-year-old restaurant worker was so worried about not being able to vote that she called the police department several days in advance, as well as her church, to make absolutely sure she knew where to go and when. Renee Kearney, of Point Pleasant Beach, said she felt additional responsibility to vote this Election Day. The 41-year-old project manager for an information technology company planned all along to vote for Obama, but said her resolve was strengthened by his response to Sandy. “It feels extra important today because you have the opportunity to influence the state of things right now, which is a disaster,” Kearney said. Election Day came early for more than a third of Americans, who cast ballots days or even weeks in advance. An estimated 46 million ballots, or 35 percent of the 133 million expected to be cast, were projected to be early ballots, according to Michael McDonald, an early voting expert at George Mason University who tallies voting statistics for the United States Elections Project. None of those ballots were being counted until Tuesday. Biden and his wife, Jill Biden, were among the first voters Tuesday in at a polling place in Greenville, Del., Biden’s home state. Smiling broadly, Biden waited in line with other voters and greeted them with a handshake. Outside he sent a message to people across the country who may encounter crowded polling places. “I encourage you to stand in line as long as you have to,” he told television cameras. 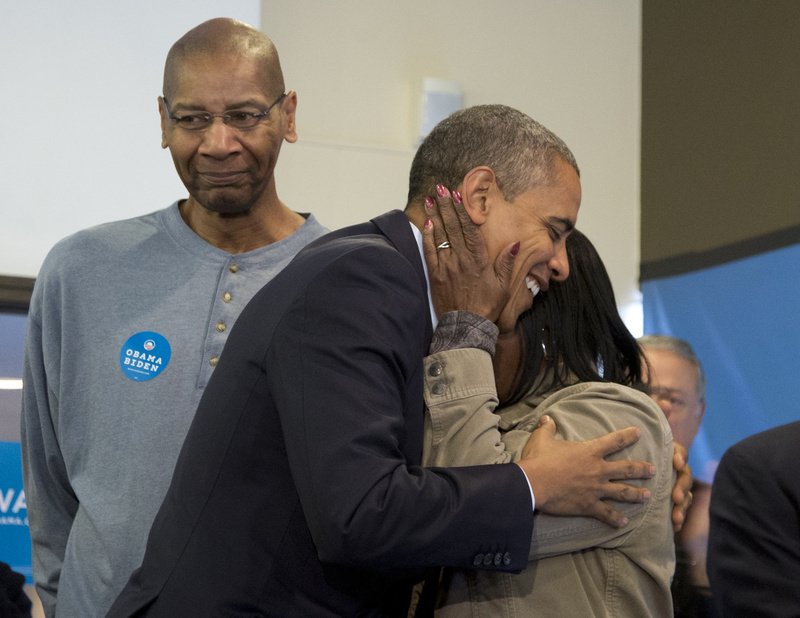 The Obamas voted last month in an effort to encourage supporters to vote early. The men on the GOP ticket each voted with their wives at their side Tuesday morning in their hometowns – Romney in Belmont, Mass., and Ryan in Janesville, Wis. – then headed to meet in Cleveland for some retail politicking at restaurants and other unannounced stops. The last-minute nature of the swing made it too difficult to arrange a big public event, but their hope was their joint visit would get local news coverage that might translate to more support. Romney and Ryan visited a campaign office in in Richmond Heights, Ohio, to thank volunteers. 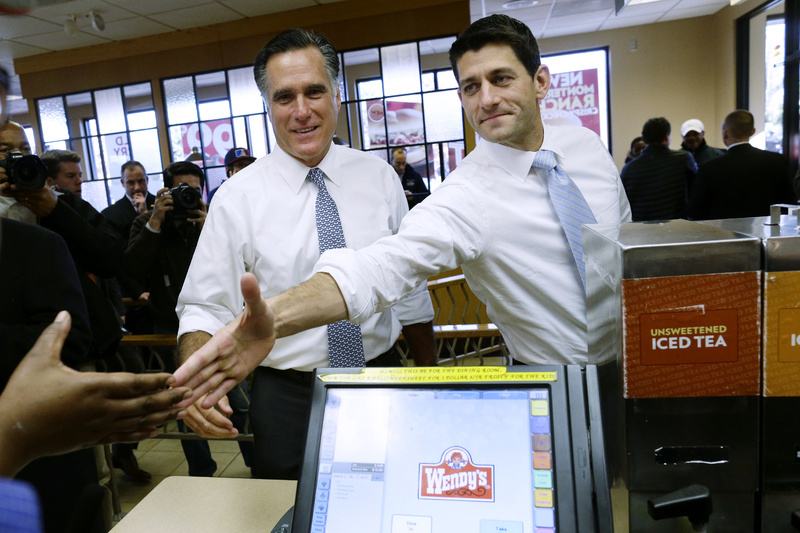 “This is a big day for big change,” Romney said.” The pair then stopped at a nearby Wendy’s for quarter-pound hamburgers. Both sides cast the Election Day choice as one with far-reaching repercussions for a nation still recovering from the biggest economic downturn since the Great Depression and at odds over how big a role government should play in solving the country’s problems. Romney argued that Obama had his chance to help Americans financially and blew it. “If it comes down to economics and jobs, this is an election I should win,” Romney told Cleveland station WTAM. With both sides keeping up the onslaught of political ads in battleground states right into Election Day, on one thing, at least, there was broad agreement: “I am ready for it to be over,” said nurse Jennifer Walker in Columbus, Ohio. The election played out with intensity in the small subset of battleground states: Colorado, Iowa, Florida, New Hampshire, Nevada, North Carolina, Ohio, Virginia and Wisconsin. Romney’s late move to add Pennsylvania to the mix was an effort to expand his options, and Republicans poured millions into previously empty airwaves there.